What does one wear for sunny days in Monte Carlo? well, when it's all about yacht dreaming and Ferrari watching, a chequered dress seemed just about spot on. Only thing missing was the picnic basket. 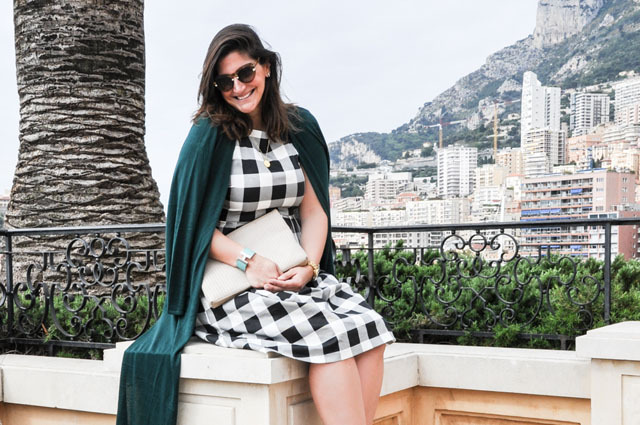 I had some mega silver wedges from Hushpuppies keeping my feet comfy as we roamed around town and a sleek pair of Louis Vuitton shades to fit right in with the posh people of Monaco. It was certainly a day, and an outfit, to remember. As I said on instagram, however, I do believe Cher from Clueless would have commented upon this attire as follows: "She could be a picnic in that dress." Too harsh? I love it! Fashion Foie Gras worked in collaboration with Hushpuppies.